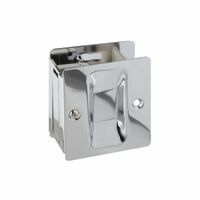 Johnson Pocket Door Pull, Dummy, Suitable For Use With: 1-3/8 in Door Thickness, 2-1/8 in Diameter, Bright Brass Plated Fits doors 1-3/8" to 1-1/2" thick. Pre-assembled for doors opening left to right. Plates are reversible for doors opening right to left. Overall size: 2-3/4"H x 2-1/2"D. Fits 1-3/16" center to center double "J" track systems. 1" diameter plastic wheels. Adjustable bracket is designed to mount on top of door. Convex roller edge. 4 nylon wheels; spring-loaded; steel bracket; adjustable up to 3/8" height; for pocket doors 1" to 1-3/4" thick; up to 100lbs each. Convex roller edge. Fits doors 1-3/8" to 1-1/2" thick. Pre-assembled for doors opening left to right. Plates are reversible for doors opening right to left. Overall size: 2-3/4"H x 2-1/2"D. Fits doors 1-3/8" to 1-1/2" thick. Pre-assembled for doors opening left to right. Plates are reversible for doors opening right to left. Overall size: 2-3/4"H x 2-1/2"D.
Three 1" Dia. nylon wheels; steel top mount adjustable bracket used on pocket doors; sliding doors; and bi-folding doors. Top mount. Flat roller edge. Fits doors 1-3/8" thick. Designed with latching mechanism to lock door. For safety purposes, door can be unlocked using screwdriver. Fits doors 1-3/8" to 1-1/2" thick. Pre-assembled for doors opening left to right. Plates are reversible for doors opening right to left. Dimensions: 1-1/2" D x 2-1/4" H.
Fits doors 1-3/8" to 1-1/2" thick. Pre-assembled for doors opening left to right. Plates are reversible for doors opening right to left. Dimensions: 1-1/2" D x 2-1/4" H. Fits doors 1-3/8" to 1-1/2" thick. Pre-assembled for doors opening left to right. Plates are reversible for doors opening right to left. Dimensions: 1-1/2" D x 2-1/4" H. Used to support flat poles up to 1" in diameter. Mounts on vertical and horizontal surfaces. Decorative design. Visual-pack.